Good tool selection, knife is very handy. Everything you need, get it! Strips are too wide for most punctures and need to be sliced lengthwise. Otherwise work well and easier than removing the tyre and patching from the inside. Great kit. It has evertything you need to repair your Tubeless setup. Everything you will ever need when something goes wrong with your tubeless and it is not fatally big. Just what I needed for my mountain bike. Now that the colder weather is here and the hard ground seems to be less forgiving to all our equipment. I've had need to swap out and install a tube on a cold and wet day when a piece of slate put a gash in the tread, this kit would have saved me some time and got me going again whilst still warm enough to continue. I've not used my own kit yet but have seen them in action and they work. The kit contains everything you need for a serious trailside repair, here's hoping I never get to use mine. Nice little kit. The bacons/strips are quite large in diameter, and a bit of a faff to get in the insertion tool. Some suggest to cut them lengthways as well as in half, I might give that a go. Strips are still sticky and the quality is decent. I've put the contents in a slightly smaller sized container with some other bits and pieces (spare valve core and remover, small bit of chain with a quicklink), good to go. I have a terrible affinity to punctures... and have spent quite a fair amount of money and time repairing tires/replacing tyres. This kit is the most comprehensive and economical of all the kits I have tried. The only criticism I have would be that the box/container is a wee bit big and doesn't close well. The rest is worth the money. Bought this off the back of an MBUK review and was not disappointed. Repaired a big hole in the tyre that wouldn't repair using sealant alone and then two more, both in the side wall. Only downside is that you have to make a small hole bigger to get them to fit. A bit tricky to get the actual repair plug through the insertion tool to put it into the tyre but once in it worked a treat. I also cut the plugs in half before using them as I would have had to trim about half off anyway once in. This didn't affect how they worked as I cut them after putting them into the tool. Excellent bit of kit and great value. Have yet to use the repair kit thankfully, but it fits nicely in my rear jersey pocket and I am confident it will do the job on the day. I was told about this kit by a friend, it bailed him out on ride were he wasn't carrying a spare tube. I now carry this as a back up. Seems great value for money and there's quite a lot with it. Overall it's smaller and lighter than an inner tube. Contains all you need, good case, just need a band around it to keep it from opening. Definitely the best system for tubeless repairs I've used, especially for holes in the sidewall. Simple and quick to do even out on the trail. Faster than putting a tube in! Very light to carry (~60g, lighter than an inner tube) - I carry one of these (minus the silly marker) and a spare tube in my tiny saddle bag just in case my tubeless goes awry. A clever kit that should be able to get you out of a reasonable sized hole in the tyre. If it tears, then you're out of luck but this is perfect for most everything else. 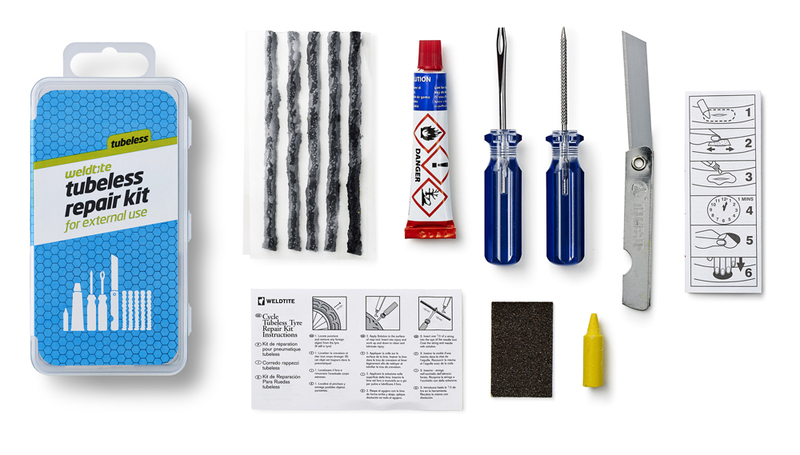 Complete kit with everything you need to mend a puncture/slit in a tubeless tire. Seems quite a big kit, so might not carry it all. Yet to need to use it, so can't say at this point if it works or not. Great product. I always have It with me. You can fix the tube in a minute. I've used these to repair larger tubeless tyre punctures many times now and great for getting you home / permanently fixing the tyre. Much cheaper than buying a new tyre and a must if your tubeless IMHO. A must have piece of kit if you ride tubless. Everything you need should you be unlucky enough to have a tear in your tubless tyre. Comes with 4 strips which can be cut in half to fix an average puncture. Although it's recommended to replace tyre I've run the tyre long after the repair. Few tips. As with all tubless systems always best to carry CO2 cartridges in order to get tyre back on rim, and for those down hillers Weldtite also do a kit for motor bikes where the bungs are much bigger so in theory they'll plug a bigger hole and at least get you home.